It’s been raining all weekend, but today wasn’t too cold. I pulled on my rain gear and walked down to the canyon at Reed. It felt great to be out. 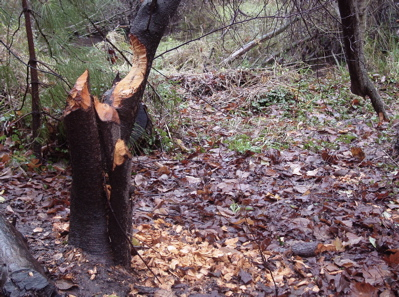 I didn’t spot the resident beavers, but they’re around. 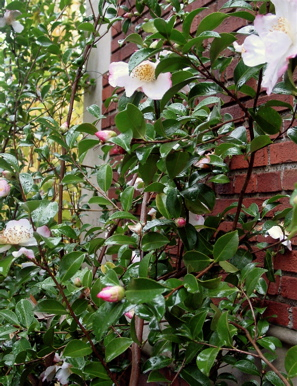 I don’t think of camellias as December flowers, but they look as good now as they do any other time. In the more urban part of my walk, I listened to Sara Zarr’s How to Save a Life until my player’s battery died. Both this one and David Levithan’s Every Day, which I read last week, keep making me think in the back of my head while I read, “How’s the author going to pull this off? Corner is painted…what’s the path out of it?” I sort of wish I could turn this writerly perspective off, because it’s different from wondering how the characters will solve their problems. Every Day weakened a little at the end, I thought, with a Brand New Choice taking center stage. (And the main character’s last machination? It’s in character but kind of obnoxious, I thought, a little insulting and unnecessary!) I still don’t know what will happen with How to Save a Life. But highly worthwhile, both of them. Sanguinity and I watched Terminator 2: Judgment Day last night! I hadn’t seen it since college. Why is it called “Judgment Day”? It isn’t actually about Judgment Day. Anyway, you know what I could hardly stand? The way Sarah and John both have their bangs in their eyes. Srsly I was like, fine save the world but please get your hair out of your face! It’s no coincidence that I trimmed my bangs this morning. Work this week, and then a week and a half off! I secretly love the budget furloughs. I’d never take this many vacation days on my own for “no reason,” meaning no extended travel, but I’m psyched.